SBC SMALL BLOCK CHEVY TWIN TURBO KIT STAINLESS STEEL MANIFOLD 57mm T04E 400+ HP. The most complete turbo package available for the price. This package has all new quality parts that are capable of producing well beyond 300 horsepower at 25+ PSI with supporting modifications and a built motor. This is the most complete package available compared to others at an affordable price. On a stock motor the kit will create give the motor a 100-150 horsepower gain on a low boost setting of 8 PSI. Also, the included electronic turbo timer provides a hassle-free operation of precisely calculating the cool down period to ensure a proper cool down for your turbocharged motor. Works with either automatic or manual gearboxes. This kit may allow you to keep your air conditioning and power steering for a great street setup Twin T04E Turbo Chargers. Capable of boosting horse power up to 300+ BHP. High quality material, cast housing with durable steel. Standard T3 5 bolt downpipe flange pattern. Intake inlet & outlet: 3" & 2" Compressor. Exducer: 55.9 Turbo Manifold. Made of high grade slainless steel. Flange fits T3/T4 turbo charger, wastegate flange fits 35MM and 38MM wastegate. Increase air flow, horse power and torque Intercooler. High performance twin turbo racing design. Made of T-6061 aluminum durable material. Help reduce engine inlet temperature. Allow more HP at the same boost level & even more power at the higher boost level. Full Size: 30" X 11" X 3. Core Size: 22" X 11" X 3 Intercooler Piping. High quality made of T-6061 aluminum light weight design. Great for turbo DIY builder, modification needed to fit in your vehicle. 180 Degree U Pipe x2. Straight Pipe x2 Type-RS Blow Off Valve. CNC machined billet aluminum material. Adjustable: Hold up to 30 PSI boost. Letting pressure surges vent when shifting and/or reducing throttle to protect the turbo. Performance design produces a powerful and aggressive sound. Quality design will not leak under high boost conditions. Complete install kit included 38mm Wastegate. High strength cast steel body with steel head. Comes with 8 psi spring installed. Protect the turbo system from over boosting. Complete install kit included Boost Controller. Can be setup to adjust boost PSI on the fly. Can be adjusted for any PSI level desired. Complete install kit included Fuel Pressure Regulator. Adjustable fuel pressure regulator with 1:1 ratio. Fuel pressure regulator can deliever high performance, with long life and high reliable operation. Adjustable from (10-15) psi to maximum fuel pump capacity. 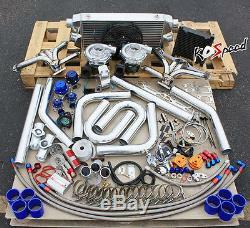 Complete install kit included Turbo Oil Feed Line. CNC machined stainless steel braiding to resist heat. 36 feed line, 1/8 NPT. Made by high strength steel with aluminum material. Strong "T" fitting to hook up to block. Complete install kit included Cooling Fan. Fan can be used to cool: A/C condenser, oil or transmission cooler, mounting on an intercooler to prevent heat soak, or cooling a radiator. Slim design provides excellent engine bay clearance. Includes the mounting tabs for a easy zip tie install. Fan Diameter (in): 10.100 in. Height (in): 11.250 in. Width (in): 10.650 in. Thickness (in): 2.500 in. Number of Blades: 10 blades. Maximum Fan RPM: 2150 rpm. Amp Draw: 11.55 amps. This is a reversible fan that can be used as a pusher or a puller Oil Cooler. Made of high quality aluminum. Powder coated for durability and oxidation protection. Useable to cool engine oil, transmission, or rear-differentials. Made of high quality CNC steel & aluminum. Durable design, and improve turbo performance by draining excessive oil, and can recycle oil back to the turbo. 10AN Fittings, 17 Length Oil Filter Relocation Kit. Made out of high quality aluminum with CNC laser cut. Oil Filter relocation for easy access, a must for hard-get oil filter. 3/4-16 (An-8) thread fitting and 7/8 x 12 1/8 bolt pattern Oil Catch Tank. Ensure Better Mileage and Better Performance. Catch Oil and Slude to Save the Life of the Engine Voltage Stabilizer. Improve audio quality Turbo Timer. Memorize and Correct Warm Up Time Automatically. Ensures a proper cool down for your turbocharged car every time. Includes pigtail wiring and extra wiring for ease of installation. Important to prevent premature turbo wear and failure. Mounted inside the vehicle for on the fly adjustments. Precisely calculates the cool down period for the motor. Increases turbocharger's operating lifespan. Failure to reduce the temperature of the turbo could result in "coking" of oil inside the turbo. Coking is the baking of oil, turning it into a grimy substance Radiator Hose Sleeving Kit. Stainless braiding makes rubber radiator hoses up to 5x stronger. Makes engine bay look of show car quality. Strong construction provides years of reliability. Anodized ends for the authentic race like finish 10 Meters Heat Wrap. Heat powers the turbochargers turbine inlet. Keep the heat inside the exhaust pipes. Heat kills the turbochargers compressor inlet. Keep the heat out of the cold piping. Control additional engine bay heat and prevent overheating. Include: Oil Pressure, Oil temp, Water temp. A Design of Smoke TINT lens. Complete install kit included Installation. Please consult a professional installer with specific questions putting this kit to your vehicle. No installation instruction included, we can only help with general questions and item information. Suitable turbocharger downpipe will be needed to complete this kit. Application: Fits all small block Chevy engines 8Cyl from'55+ using the standard exhaust pattern - 283, 305, 327, 350, 400, etc. TM-CT-S-T3, TBC-T04E-63-X2, ITCL-TT-L, FMICPP-U-25-ST, FP-G250-X2, BOV-GRS-BL-X2, WG-38-SL-X2, GA-OP-27, GA-OT-27, GA-WATER-27, TT-PEN-SL, WRAP-T4, OCT-G-SL, VS-SL, BH-P, BC-BL-X2, OFRL+L, ODL-X2, OFL-X2, OC-12R-BL, FPR-S-SL, RAF-12+FMK. Minor modifications may be required for certain models. For emissions related items, please check with your local jurisdiction for emission specific requirements before purchasing. No installation instruction included unless otherwise specified. Some of the packages cannot be delivered to a PO Box. Package will be held until a valid physical address is provided. The item "SBC SMALL BLOCK CHEVY TWIN TURBO KIT STAINLESS STEEL MANIFOLD 57mm T04E 400+ HP" is in sale since Thursday, May 10, 2012. This item is in the category "eBay Motors\Parts & Accessories\Car & Truck Parts\Turbos, Nitrous, Superchargers\Turbo Chargers & Parts". The seller is "kospeed2008" and is located in Rowland Heights, California.